The ICFP Personal Wealth Building Guides offer proven strategies and invaluable information for putting together the many pieces of a financial plan and reaching personal, long-term financial goals. Highly readable and interactive, these guides will help you establish clear-cut objectives and furnish you with the wherewithal for achieving them. How much money will I need for a comfortable retirement? How will early retirement affect my pension? Should I take a lump sum distribution or roll over my retirement benefits? 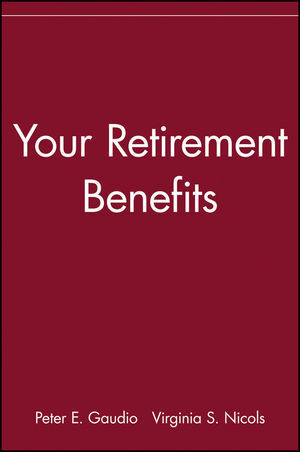 Your Retirement Benefits delivers clear, down-to-earth answers to these and hundreds of other frequently asked questions about the retirement planning issues and decisions facing employees and business owners alike. It explains what you need to know about every major benefits plan in existence, how to choose the right plan and make it work for you, and how to insure the best deal at retirement. What's more, this valuable sourcebook helps you manage your benefits plan while you're still employed and guides you step-by-step as you make critical retirement decisions. It's chock full of anecdotes, worksheets, and personal action plans for organizing your financial information and putting your own retirement plan to work today. As in other ICFP Personal Wealth Building Guides, this important work features Action Items alerting you to the bases that must be covered before proceeding with a given plan.Wealth Building Profiles that add a lively, human dimension to the financial principles discussed.Questions and Answers on top-of-mind issues.Checklists at the end of each section reviewing key points.and Wealth Building Worksheets that lead you step-by-step through important planning decisions. PETER E. GAUDIO is a widely acclaimed lecturer and financial management consultant on retirement benefit plans. VIRGINIA S. NICOLS is a noted authority on personal financial management and tax planning. The Institute of Certified Financial Planners is a national, nonprofit association established in 1973. To qualify for membership in the Institute and earn the designation of CFP? (TM) (Certified Financial Planner), planners must meet rigorous educational requirements and aspire to the highest levels of professional competence and ethical conduct. Retirement Plans That You Control. Employee Stock Ownership Plan (ESOP). Simplified Employee Pension (SEP) and Cash or DeferredArrangement (CODA). Getting Money Out of Retirement Plans Your EmployerControls. Getting Money Out of IRAs and Other Retirement Plans YouControl. IRA Rollovers and Trustee-to-Trustee Transfers. Making Sure Your Spouse Gets Your Retirement Benefits. Getting Started with Retirement Income. Enhancing Your Retirement Income Using Life Insurance.